Here's your chance to get personal with your guests and let your creativity flow! With this candle favor you can showcase your individual style and design a label that makes a "just for you" memento of your special day. Sold only by Fashioncraft, each 2"x 2" Personalized Expressions candle has a frosted glass holder with a tealight votive candle inside. 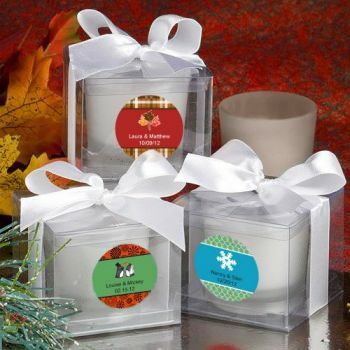 Each comes beautifully packaged in a 2" x 2" clear acetate box, wrapped and tied with a white satin bow  perfectly fit for you to easily apply the personalized label of your choice. From assorted hot color combinations, to adorable themed designs, to your own title you can make the label truly your own. Please allow 3-4 days for processing. This item no longer comes with a poured white votive candle, instead it comes with a white tealight candle. These were used as a memento gift for guests at a wedding rehearsal dinner. They were able to be personalized with names of the bride and groom and the colors of the wedding. Everyone loved them. Shipping was on time with extra stickers. I will use this site again. I love the product and how quickly it arrived. Very satisfied. Plan to get more things from you.